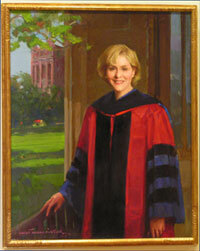 The recently unveiled portrait by Everett Raymond Kinstler of Dr. Judith Rodin, who served as Penn’s president from 1994-2004. The portrait is hung on the first floor of College Hall. President Amy Gutmann emphatically restated Penn’s resolve to keep the University safe; she noted that in response to recent off-campus incidents, the UPPD has made several arrests and she said, “we will restore a sense of safety.” Dr. Gutmann also highlighted the recently published Response to the Minority Equity Report, from the President and Provost (Almanac November 1, 2005). She noted that last year she laid the foundations and this year she is moving forward with initiatives such as the Campus Master Plan to make Penn an “ever more vibrant campus.” Global engagement—to forge stronger institutional ties throughout the world; the president will be traveling to India, China, Singapore and Hong Kong. Recruiting and retaining first-rate faculty—seek to broaden diversity and make the first PIK appointment by the end of this academic year. Financial aid—still one of the president’s top priorities although 140 new scholarships have been created so far. The five-year Campaign—starting from a position of strength. Provost Ron Daniels reported that as of this summer Dr. Perry Molinoff, the vice provost for research, is directly responsible for the area of Technology Transfer for which he recently appointed Dr. John Zawad as the managing director of Intellectual Property and Technology Transfer (Almanac November 1, 2005). The Provost also reported on Dr. Janice Bellace’s recent promotion to deputy provost (Almanac October 25, 2005). There will be a conference in Washington, D.C. on December 1 at which Penn faculty will meet with senior policymakers concerning post Katrina issues like dealing with risks. The Penn Press will be publishing a book of the proceedings that will be distributed to all members of Congress. The Penn Museum is involved in a conference this month on teaching evolution in schools. The School of Nursing has completed the first of three phases of renovations. In the financial report, EVP Craig Carnaroli described FY05—which ended June 30, 2005—as a very positive year primarily due to investment performance and contributions and higher patient volume and higher payment rates at the health system. Penn concluded FY05 with total assets of $9.3 billion, total liabilities of $2.9 billion, and net assets of $6.4 billion. He also reported that during the first quarter of FY06 there was a 3.5% increase in total net assets to $6.611 billion and total endowment value is now $4.373 billion, an increase of $177 million since June 30, 2005. Dr. Arthur Rubenstein gave the Penn Medicine report in which he mentioned the recent groundbreaking for the Center for Advanced Medicine, that will be a 21st century patient-centered facility. He commended Penn for having six faculty including four from SOM, among the 64 researchers and physicians named to the Institute of Medicine (IOM) of the National Academies. The Budget & Finance Committee presented four resolutions that were passed: to authorize the revised scope and budget for the design and construction of the Fisher-Bennett Hall renovations for an additional $2.8 million (for a revised total of $23.7 million); to authorize the installation of sprinkler and fire alarm systems in Sansom East in the amount of $5.55 million; to authorize design and construction of the Law School Tannenbaum Hall seminar and office renovations in the amount of $4 million; to authorize a lease for the School of Medicine, department of physiology at the Abramson Research Building, 11th floor, with a net present value of $1.5 million. Facilities and Campus Planning had a presentation during their committee meeting from Pulitzer Prize winning architect Fumihiko Maki of Maki Associates who is designing the building for the Annenberg Public Policy Center, which will be built on the site of the former Hillel on 36th Street. President Gutmann announced at that meeting that the new four-story building will have a great public lecture space to be known as Agora where there will be an annual lecture series in honor of the building’s benefactor, Leonore Annenberg. Scott L. Bok was elected as a term trustee and David L. Cohen was re-elected as a term trustee; L. John Clark was elected as a charter trustee. Mark B. Davis and Pamela S. Johnson were appointed to the Law School’s Board of Overseers. Richard D. Feintuch was appointed to the Annenberg Center’s Board of Overseers. Nancy Horwich Rothstein was appointed to GSE’s Board of Overseers. Carrie Cox and Susan B. Danilow were appointed to the Museum’s Board of Overseers. Ellen Moelis was appointed, Alberto Vitale was reapppointed and Lawrence S. Schoenberg was named chair emeritus to the Libraries’ Board of Overseers. Jay Goldman, Cindy S. Moellis and Mark Ostroff were appointed to the School of Social Policy and Practice’s Board of Overseers. David Pottruck was appointed to the Wharton School’s Board of Overseers. Pedro W. Lichtinger was appointed to the School of Veterinary Medicine’s Board of Overseers. John S. Middleton was appointed to the Board of Trustees of Penn Medicine. Annette Fierro was appointed to the Board of PennPraxis.